Athletes foot, Tinea pedis, is a skin or epidermis based fungus. Mold or yeast grows on the surface of the skin and eventually it makes its way into the living tissue if the environment is suitable. Athlete’s foot usually occurs in the spaces between the toes, but if not taken care of properly, tinea pedis can spread to the sides and bottom of the feet. The most common fungus that causes athlete’s foot is Trichophyton, a fungi that thrives in moist and warm areas of the body, such as the feet. Athlete’s foot can be determined by certain symptoms including flaking, itching, and scaling on the affected parts of skin. In some cases cracked skin and blisters can appear, leading to raw and exposed tissue, causing a secondary bacteria infection along with the fungal infection of athlete’s foot. 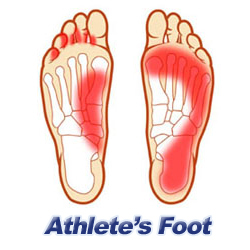 To treat athlete’ foot there are two main approaches. First, targeting the source of the fungal infection and creating a less suitable environment for trichophyton fungi. Purchasing shoes that are a breathable material, such as leather, and wearing absorbent socks that keep moisture away from the foot, like cotton, prevent the fungi from growing and spreading. The use of talcum or medicated powers, like tolnaftate or miconazole, can keep the feet dry and free of excess moisture. Aluminum acetate, which is a drying solution, is used to soak the feet and dry up the athlete foot fungus. After creating a dry and clean area where the athlete foot fungus can not breed, antifungal creams should be used. Many medications are available to treat athlete’s foot, including over the counter medications. When in public locker rooms, swimming pools, and showers, wear sandals and avoid walking barefoot. Fight moisture in shoes by wearing absorbent socks and change them often. Using Natural Foot Powder can reduce perspiration. Wearing breathable shoes that allow moisture to escape. Often times fungicidal and fungistatic chemicals do not eliminate the fungi in the horny layers of the skin. Topical creams and antifungal drugs taken orally are more frequently used and often times more efficient at treating athlete’s foot.